Thank You very much for this world. Thank You for creating us every moment by Your Inspiration. Today is miraculous day. Today I am ensured in Great Truth I am writing here by magic wave of joy. I felt It suddenly. I felt It in swimming pool. It was a Wave of Joy. Suddenly I become the happiest person on the planet. Thank You for understanding I am You. I am God. I am Creator. I have everything You have. From this moment I will respect every my cell and atom. From this moment I respect each my thoughts and wishes. I love my life. I live every moment in happiness, creativity and realization. I live my unique life. I am flying in joyful waves. Thank You for today and for now. 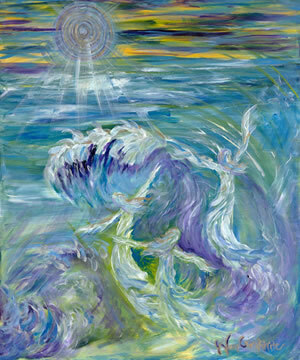 I love this picture by Janice Van Cronkhite “Wave of Joy”. It reflects what I am thinking about.